The much-loved 1930s Marina Pavilion in St Leonards has been renovated to become a high-quality, year-round seafront entertainment and conference venue. The Marina Pavilion has been a landmark venue for many years, it’s location making it part of the area known as “Burton St Leonards”, named after the well known London builder James Burton, between 1827 and 1837. Burton conceived the town as a brand new seaside resort for the wealthy and it quickly became popular with royalty and the aristocracy. 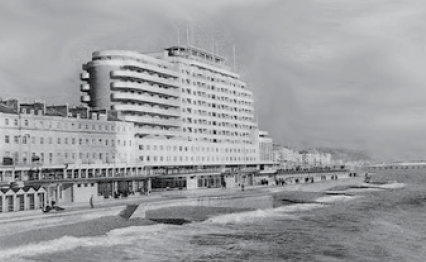 The famous Marine Court building opposite Azur was constructed between 1936 and 1938. It was designed to look like an ocean liner by architects Dalgleish and Pullen and, at the time was the tallest apartment block in the country. A versatile venue catering for any function or event you can imagine from gala dinners, weddings, business conferences, a meeting place or just somewhere to relax and enjoy the view. Azur at the Marina Pavilion is a unique beach front multi-use venue for hire. You won't find any other venue which boasts our fantastic balcony facility. Our team of friendly experts, whose wealth of experience within the wedding sector will ensure you have memories to treasure for a lifetime. From breakfast meetings or business conferences to team building events, Azur provides the facilities you require. From Anniversary and Birthday parties, Gala Dinners, Charity Events, Christenings, Funerals, Baby Showers to name a few, Azur provides a stunning venue with flexible offerings to meet your needs.